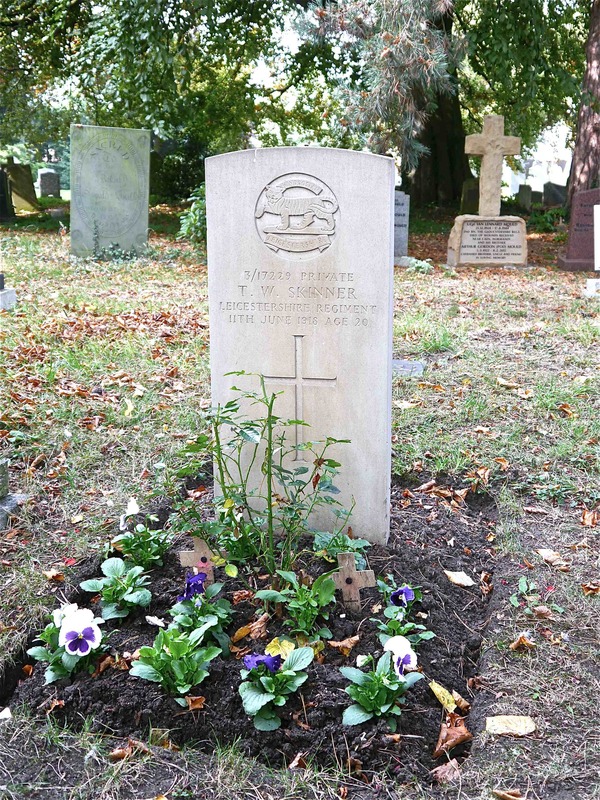 Thomas William Skinner was born in 1898 in Bottesford, the eldest child of George and Kate Skinner. Tom was the eldest of five children that included Edith, Frank, George & Doris. The family lived on the High Street in Bottesford before moving to Normanton. His father was a farm worker as was Tom when he left school at the age of twelve. Tom Skinner was only 17 when he volunteered. His record of enlistment, on Saturday 6th March 1915. His age is clearly and precisely stated as 19 years 65 days. He initially signs his name as ‘Thomas William William’ before amendment to ‘Thomas William Skinner’. Possibly a sign of nerves that his age might be questioned, all the more likely given his short stature. Even though the average height of men enlisting was only 5’5” he was even shorter at 5’4”. He would grow an inch over the next 3 years. The following Tuesday he reported to the Leicestershire Regimental Depot before posting to the 3rd Battalion stationed in Hull for training. After seven months of he was posted to France on the 4th October to join the 2nd Battalion, Leicestershire Regiment. At the outbreak of war the 2nd Battalion, as a regular army unit, was stationed in India. It was mobilised to serve on the Western Front and took heavy casualties. 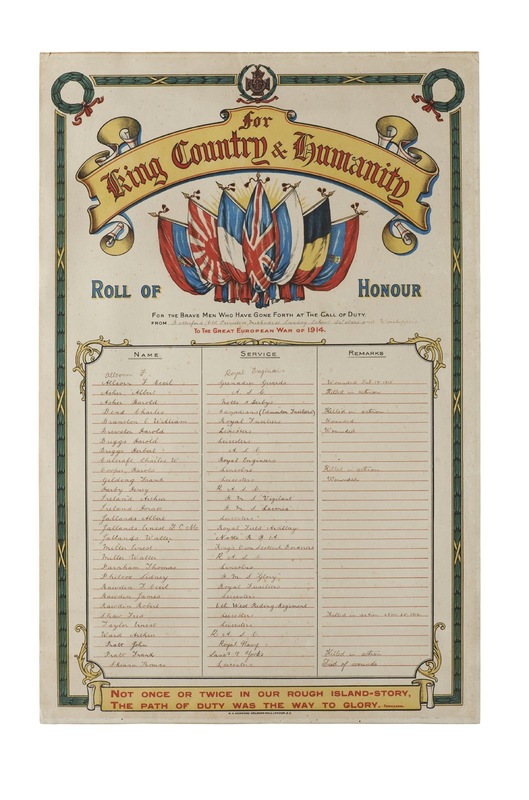 By the time Tom Skinner was posted to France the 2nd Battalion was no longer staffed by regular soldiers and was now largely made up of new Kitchener Army volunteers with a leavening of those with regular army experience. Tom sailed with the 2nd Leicestershires from Marseilles on the 10th November 1915, arriving in Alexandria on the 16th November. From there they travelled by train to Port Said and embarked on the 22nd November for Basra. 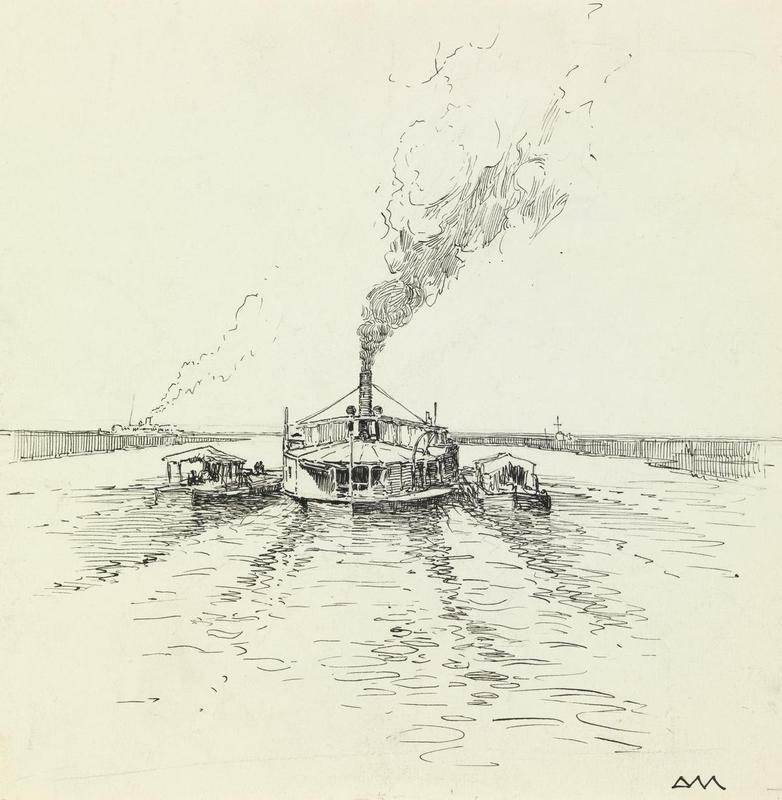 Their two troop ships arrived at the mouth of the Tigris on the 6th December and proceeded upstream to Basra. On the 8th December the 2nd Battalion trans-shipped to the River Steamer Medjidieh and a river barge to make headway towards Kut-al-Amara some 250 miles further upstream. 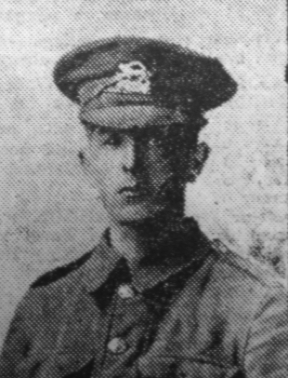 His parents might well have felt relief that their young son would be spared the rigours of the Western Front and that two other local men with front line experience, Bill Sutton from Bottesford and Ernest Wakefield from Muston, were with the same Battalion. Sadly his service as part of the Tigris Army Corps in Mesopotamia would be brutally short. Rain, mud and cold would define the experience on the Western Front. Foul water, extremes of temperature and illness was the experience of soldiers in Mesopotamia. In addition the medical transport, supplies and personnel were woefully insufficient to deal with the high numbers of battle casualties and illnesses. The Tigris Army Corps had been set up to relieve the India Corps who were besieged at Kut-al-Amara after a failed attempt to take Bagdad. 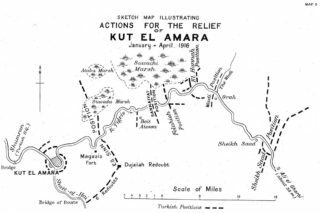 Between January to April 1915 the Tigris Army Corps attempted to advance up the river to Kut to relieve the India Corps. They failed at considerable cost. Tom Skinner was severely wounded on the 13th January 1916. Ernest Wakefield was killed on the 8th March. Bill Sutton was the sole local survivor, just one of about two hundred men able bodied men remaining in the 2nd Battalion, Leicestershire Regiment. The first encounter with the Turkish Army was at Shaikh Saad on the 7th January 1916. British forces attacked an entrenched positions on both sides of the Trigris. That action was a success. However very heavy casualties were sustained in two days of battle. It rapidly became apparent that there was a total lack of medical supplies and trained personnel to deal with over 4000 casualties. The wounded lay untended in cold and icy rain on the battle field through the night of the 8th and 9th January. Many died of exposure. It would take over two weeks to fully recover seriously wounded men left behind as the advance continued up the Tigris. Tom Skinner survived his first action. His Battalion remained several days at Shaikh Saad cleaning up and reorganising. A draft of 211 men arrived on the 11th January to reinforce the Battalion. The Turkish force had withdrawn to a second defensive position further upstream along the River Wadi, a tributary of the Tigris. At daybreak on Wednesday 13th January the 2nd Battalion Leicestershires and the 56th Rifles were ordered to take the forward positions of the enemy. Tom Skinner was with ‘D’ Company as it made up part of the front firing line. That initial advance was a success and both Battalions dug themselves in to await further orders. These came at 4.00 pm when they were ordered to attack the main enemy line. About 1100 yards from the Turkish front line the British forces in open ground encountered heavy fire. They advanced to within about 600 yards but sustained very heavy casualties on ground already marked with range sticks to aid the accuracy of enemy fire. Within 200 to 300 yards of the River Wadi Turkish front line they came under further heavy cross-fire from machine guns. The attack failed with a total of 648 casualties, 210 from the 2nd Battalion. Tom Skinner was shot through the lung. On the morning of the 14th January patrols discovered that the enemy positions had been evacuated. 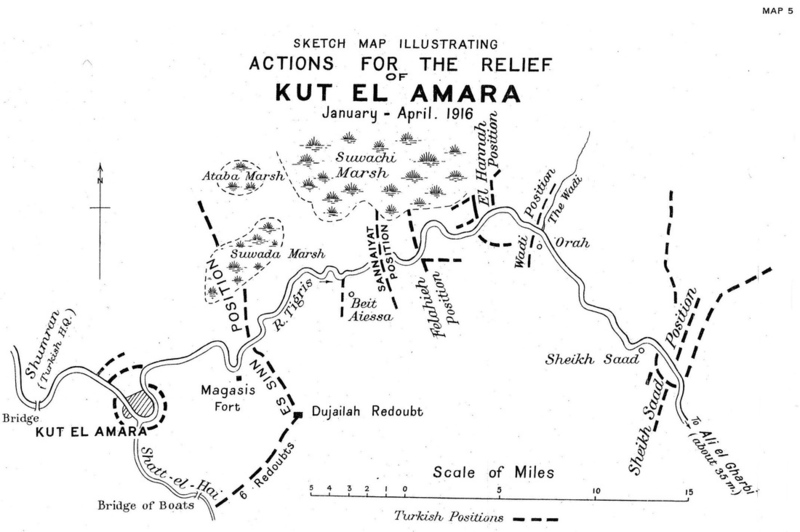 The attritition of the British forces would continue over the next three months as they struggled up the Tigris to raise the siege at Kut-al-Amara. Tom’s journey of ‘recovery’ became a different sort of struggle. Two weeks later his family in Normanton received news of his injury and that he was progressing ‘quite satisfactorily’. He was sent on the HMHS Varela to Bombay for four weeks hospital treatment on the 4th February 1916. He embarked on the 6th March arriving home on the 1st April thence to Nottingham for a month of further treatment and three weeks convalescence. 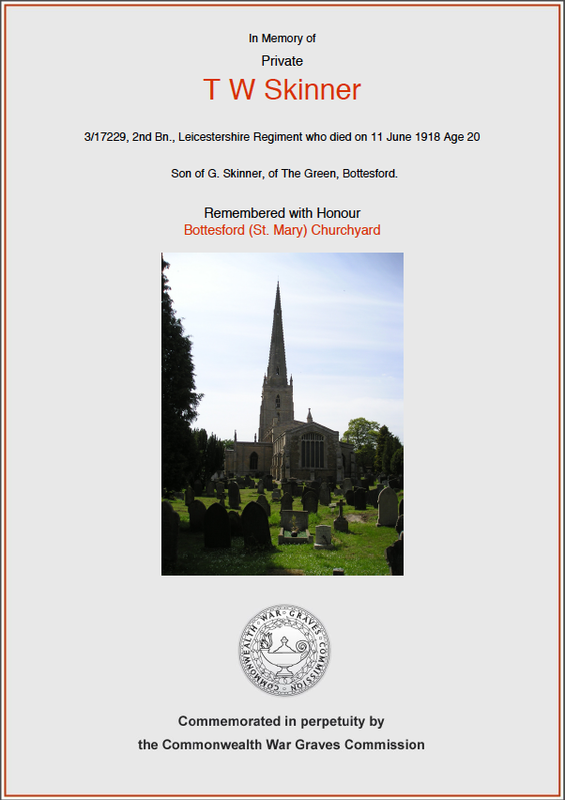 On ‘recovery’ he was posted on the 10th August on home service with the 1st Garrison Battalion, The Leicestershire Regiment. After a year he was attached to Northern Command Labour Corps at Leicester with the 410 Agricultural Company on 27th July 1917. By January 1918 his health had deteriorated to such an extent that a Medical Board at Ripon on the 10th January 1918 deemed him no longer fit for service and he was discharged on the 25th February 1918. He was awarded 30% disability pension on the basis that his heart condition, breathlessness and patch on the lung he had been shot through, had not been aggravated by any war service! Rather it was the result of having contracted scarlet fever in 1910 leaving him with a weak heart. Tom returned home to be nursed by his sister Edith at her cottage on the Green in Bottesford adjacent to the Methodist Chapel he attended. Edith was with him when he died on 11th June 1918. His death certificate records that he was a ‘(D)ischarged Private Labour Corps 454190), that there was no post mortem and that he died from symptoms associated with tuberculosis. As a single person his war service disability pension ceased on his death. Tom Skinner is remembered on the Methodist Chapel Roll of Honour and his grave in the grounds of St Mary’s, Bottesford is marked with a Commonwealth War Graves headstone. We do not know the exact reason why his name was not included on the Bottesford War War Memorial in St Mary’s Church. No doubt because his had not died whilst actively serving. His sister, Edith Skinner, still made a substantial contribution of five shillings to collection in aid of the Bottesford War Memorial, the equivalent of £50 in today’s money. Tom’s discharge certificate recorded that ‘his military conduct has been very good’. Our thanks to Joyce Simpkin for sharing her research and family information about her Uncle.